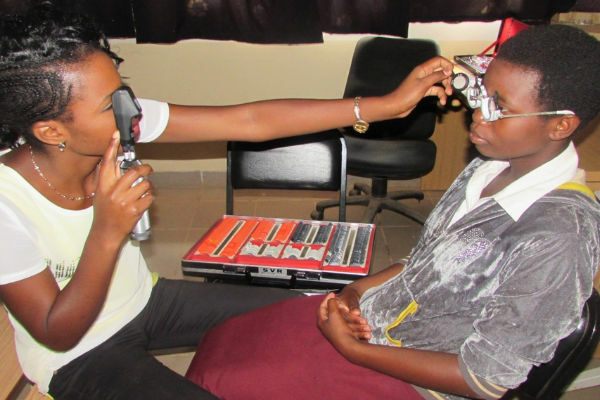 The Blantyre Institute for Community Ophthalmology (BICO) is the only registered local eye health NGO in Malawi. We were established in 2008 with a mission — contribute towards the prevention and control of blindness in Malawi and the neighboring countries in the Southern African region. Our plan of action was to do this through operational research on eye health, community eye health programme delivery, consultancy & advocacy on eye health service delivery. We are also a registered member of Council for Non-Governmental Organizations (CONGOMA) and a member of NGO Board of Malawi. Most of our projects are implemented in partnership with Ministry of Health and Education which provides policy guidance on national standards in the projects. We have been leading from the front on childhood blindness programmes with our partners since 2013. As a beneficiary of the USAID Childhood Blindness since 2015, we have been able to screen over 8,000 school children for refractive errors, and provide glasses to over 2,000 children. Low Vision is another element that BICO has implemented with support from USAID and Save the Children. Over 500 children were assessed for Low vision and several were managed with low vision devices. Apart from research projects, we have 9 rural eye clinics across Malawi whose aim is to improve eye health services access for local communities. We also support service delivery in several hospitals in Malawi, through donations of Ophthalmic equipment and supplies. Globally, Trachoma remains the leading cause of infectious blindness. BICO has become well known for tackling Neglected Tropical Diseases (NTDs) through its operational and clinical research in Trachoma and Soil Transmitted Helminth (STH). In 2018, we conducted a Trachoma impact and surveillance survey as well as Trachoma Trichiasis (TT). The survey had 30 evaluation units from 13 districts and the results certified Malawi to have dealt with the disease. This means that Malawi does not need Mass Drug Administration (MDA) for Trachoma anymore and is on track to meet WHO’s elimination target of 2020. In appreciation of this, the Queen Elizabeth Diamond Jubilee Trust gave an award to BICO for its dedication in eliminating Trachoma as a public health problem in Malawi. The track record has made us extend our services to other NTDs, such as Soil Transmitted Helminths; the common species in Malawi being Hookworm. Several hookworm infections in early childhood can cause anemia, malnutrition, growth retardation and mental disorders. The fight against Soil Transmitted Helminths (STH) continues through the research project known as Deworm3, a multicounty study targeting three countries. With funding from the Bill and Melinda Gates Foundation to the Natural History Museum, UK; subcontracted to the London School of Hygiene and Tropical Medicine, the project is expected to run up to 2022. The study is in its second year and the current activity is a census update in preparation for a Mass Drug Administration (MDA) in June 2019. London School of Hygiene and Tropical Medicine – the Deworm3 Project. Neglected Tropical Disease (NTD) Centre, USA -Trachoma Drug Coverage, Impact and Surveillance surveys. IAPB and WHO have been in the forefront– advocating for Blindness Prevention programmes, through the VISION2020 initiative. As we approach the year 2020, we are proud to be associated with the IAPB/WHO achievements, through our contribution to the elimination of blindness from Trachoma in Malawi. In joining IAPB, we believe our work will be more noticed, and that we will engage more partners, and continue scaling up blindness prevention programmes beyond 2020.